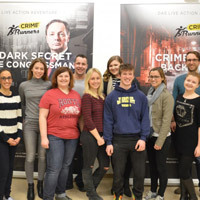 A group of Webster Vienna students in the WebsterLEADS leadership program recently spent an afternoon of team building and problem solving at Crime Runners, a "room escape experience" in Vienna co-founded by Webster alumnus Stefan Tauchhammer (MBA '09). Like other exercises in the program, the experience encouraged students to participate and then reflect upon teamwork and leadership under time constraints, and in unpredictable surroundings. "I was a little nervous meeting new people, but it turned out to be a lot of fun, the activities at Crime Runners were amazing!" said Angelika Kurnosenko, the newest member of the current LEADS group in Vienna. See the original story at Webster Vienna. For over 20 years, WebsterLEADS has engaged students in an on-going application of scholarship and practical leadership experiences that develops a foundation from which they will change the world. The University’s undergraduate student leadership development program began with a focus on a handful of involved students on the home campus in Webster Groves, where Webster University was founded in 1915.